Probably wisely and certainly intriguingly given the setup, writer Peter Anghelides tells four small tales that weave into a cohesive whole, beginning with the Eighth Doctor landing on a Jariden space station where his Fifth incarnation is attempting to stop a dangerous experiment with time. As the Daleks appear with one Colonel Ulrik in tow as they seek a device within a shrouded vault, the story takes an unexpected turn as David Bamber’s Ulrik is thrust into the role of flawed protagonist by becoming the narrative link for each of the four smaller stories. This loop is quite tactfully constructed and manages to bring all four Doctors into the equation successfully and fairly equally as Ulrik travels through time and repeatedly comes into contact with the various Time Lord iterations, though the brief time allotted to each doesn’t quite allow for a completely thorough exploration of Ulrik’s changing motivations and actions. It’s the clever interlinking of the narratives that provides such a unique twist on the multi-Doctor format, and though increasingly-complex temporal narratives have become more commonplace in the modern television series, this is certainly a story that only the audio medium can tell. Some listeners may be put off by the fact that the Doctors take an almost supporting role to an overtly flawed protagonist instead of having the release showcase all four together as the title may imply, but the script and performances manage to perfectly capture the very essence of each of the four very distinct personalities. The Sixth Doctor’s thread is arguably the strongest, revealing some key information from the past while truly allowing Ulrik to meaningfully develop as a character, but each of the anthology-esque vignettes breezes by with excellent performances and pacing and ties in nicely to the overall narrative. Of course, with so many prominent figures in a condensed running time, the Daleks who form the crux of the conflict are pushed to the side a little bit more than might be otherwise expected. Nicholas Briggs is as compelling as ever and subtly differentiates between the different types to great effect; however, there is simply not enough time fully explore the Daleks’ plan in any meaningful fashion, though part of this is alleviated by the unique chronology and shifting Doctors’ perspectives which together add an air of intrigue to what may otherwise be a very straightforward affair. 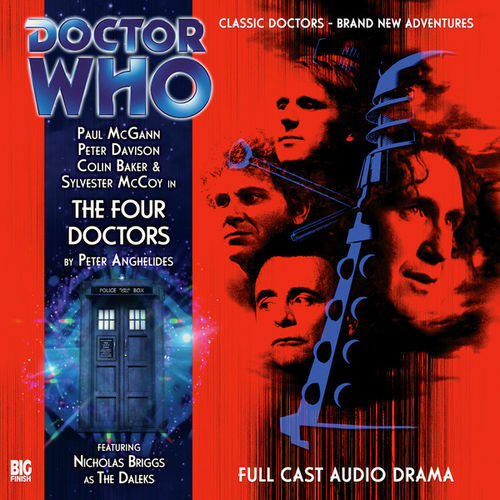 As a whole, though, ‘The Four Doctors’ is a strong showcase for the different eras of Doctor Who that Big Finish has fine-tuned over the years. Though it’s not quite the group outing that the title may suggest aside from a short addendum at the end of the main narrative, the compelling style in which the plot unfolds nonetheless creates a strong addition to Big Finish’s growing collection of Bonus Releases.